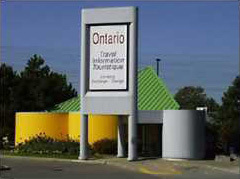 Ontario Travel Information Centres are operated by the Ontario Ministry of Tourism. They are an excellent source of information for activities throughout the Niagara Region and the province of Ontario. Provincial road maps, tourist guides, and attractions brochures are just a few of the free items at your disposal.